Trivandrum, 28 September 2012: Muthoot Pappachan Foundation (MPF), the CSR arm of the Muthoot Pappachan Group (MPG) plans to create India's largest directory of Blood Donors - The Muthoot Pappachan Life Blood Directory in association with Muthoot Lifebrigade. The directory aims to include blood donors from various parts of the country, which will also involve staff from the entire Muthoot Pappachan Group Companies. 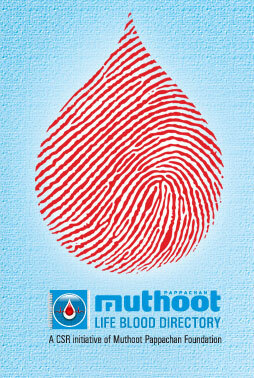 Muthoot Pappachan Life Blood Directory creates a platform for all good hearted who are willing to donate blood and save precious lives. The initiative will be launched on National Voluntary Blood Donation Day (1st October).